All Supremes since the TotalOne feel pretty much the same so it will be closer to the 2s than the 1x. The comparative model for the One90 would be the S29 in terms of build quality. But really we're talking about a 6 year old glove at this point so I would suggest trying on a 1s or 2s before you pull the trigger. Any word if there is going to be 2X skates coming this season? You'd think the launch would of been about the same time as the 2S line, for the other group. 2020 - New Supreme (3S Pro)? I really don't know how I feel about the physical pattern on the Vapour line. It's an odd choice for sure, considering the general printing/durability hurdles they already had to deal with. Why also insist on something like this? Especially since this pattern doesn't seem to relate to anything design-wise that I can think of? The 1X was similar to the Brian's Gnetik graphic where it was like a faux knee roll, but this just looks like they're doing it for fun. Mind you, the old Vapors had those rubber ridges on the gloves, so maybe there's just some internal philosophy that Vapor has to have some physical design element like that. The texture doesn't phase me at all. It didn't cause any problems on the 1x. It's just another way to add some depth to the graphics and to differentiate it in store from the Supreme. I don't understand getting so hung up about it. I'm more concerned with how busy the actual graphic is. It's disjointed and seems like it doesn't really know what it wants to be. No wonder vasilevsky has such a minimal graphic. these look horrible, especially w the dimpling. he means 2s and 2x shouldve come out at the same time. Are you referring to these rubber ridges? I'm not really hung up on it, I legitimately don't know if I'm for or against them. In some instances I really dig them, other times I'm left confused as to why even bother? Yup, had a pair of those, they're on the blocker too. I'm not trying to say they're stupid and useless (although not functional), just seems like an odd design choice to keep going forward with while battling their other issues. Also, none of the custom 1X graphics had the faux knee rolls, so if they're not part of the custom printing program, why keep them? Why not? They never caused any problems. They already knew how to do it. I don't see the issue. I rather like them. My road hockey gear in the early 90’s had a similar pattern. And then saying "yeah, but we also want to add new 3D texture to that list." I'm just saying it would have been easy for them to justify not doing that in the face of the rest of the things they had to improve. I think you're looking at this like a zero sum game. If they don't do dimpling they can spend more time on the other three. However, like I said, they already had it figured out so it was a marginal effort to update it for 2x. As far as material durability, I think they pretty much fixed that two years ago with 1s 2nd gen and went above and beyond with 2s. Dubnyk said he went the whole season with the same set of 2s pads, so I don't think it's an area they needed to spend much time on anymore. As far as custom order production and fulfillment, what would you like the designers to do? Go out to the factory floor and start working on pads? Product Design and Production are two different departments. Regarding digital printing quality, I don't see how dimpling has anything to do with digital printing. The skin is heat form and glued over a foam pad that's been pre designed, giving it the dimples. The printing is done before that head forming ever happens, so it's not like effort put into making dimples (none really) takes away from the time spent printing or the process used to do it. I work for a vendor and to get a product into my customers hands takes a lot of effort. There are teams for product performance, product design, components, supply chain, logistics, purchasing, production, QA/QC, and marketing all working at once to deliver a product to market. Decisions are made by management along the way given considerations from all of these aspects. Those decisions may not line up with what your priorities are. To say that adding dimpling to a pad is causing the digital printing quality to go down is borderline absurd and a very reductionist viewpoint on manufacturing. To say that adding dimpling to a pad is causing the digital printing quality to go down is borderline absurd and a very reductionist viewpoint on manufacturing. I agree, I don't know who said that. I just finished giving them credit for not using those other things as excuses for dropping design elements like dimpling, which I've also said I have no problems with. Some people’s biggest “knocks” on printing? It looks cheaps compared to cut and sew. Cut and sew has seems, material textures, and a 3D aspect to the graphics which give it a rich feel. I personally HATE unused color zones on a pad. However, I’ve had one company employee point out to me that they add a level of richness to the product. Like a cap toe dress shoe. They like the unused color zones. So what am I getting at? 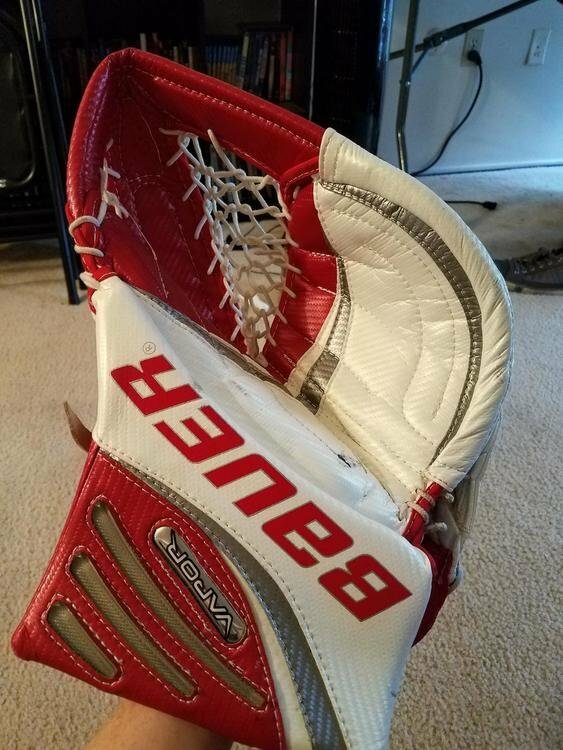 In my opinion, Bauer is looking at ways to add depth and richness to their pads. This adds depth and texture. there’s also the non goalie parent and / or young kid angle. This might impress a younger audience or non X goalie dad. Could help differentiate the product at a retail store and sell pads. It's a differentiator. Undoubtedly, the most common ordered color combo for off the shelf sales across the Vapor and Supreme lines is going to be White/White. Vapors and Supremes are going to look identical to the untrained eye in an all white configuration, so the dimpling is another way to differentiate between lines. CCM, Vaughn, and Warrior have knee rolls that do that differentiation for them so they don't have to worry about that. Like you said, it adds depth and richness. Like adding wood grain to a car interior. 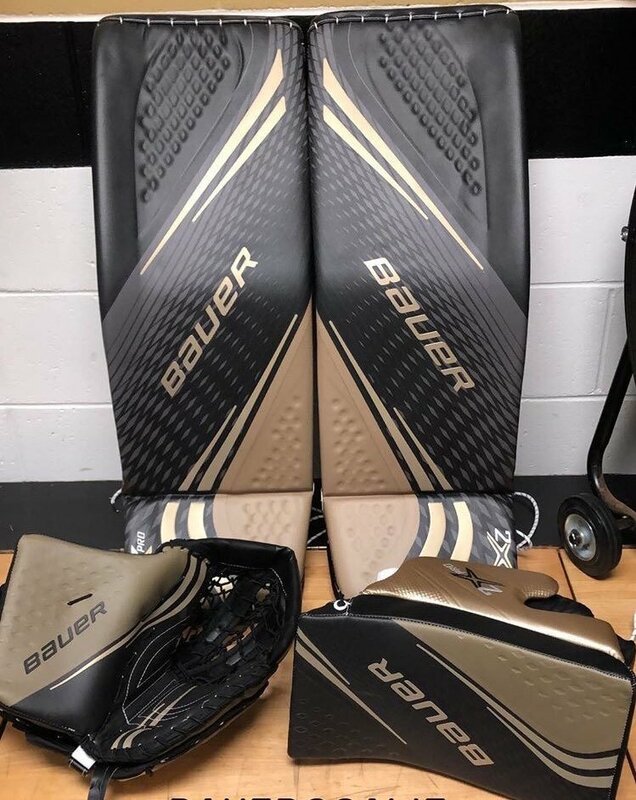 I personally love the flat printed look on Bauers because it gives the impression they've done everything possible to reduce weight. Cut and Sew reminds me too much of the big heavy pads of the past. I wish they'd make it more friendly with actual selectable color zones instead of pre-created combinations. It's hard to match my team colors (Forest Green, Black, Copper) with Bauer's limited selections without going custom printed. Has anyone done a comparison between the S and X skates? Looking to upgrade in the near future. I think in the Bauer thread there is a comparison, which is mostly just the fit and whether your feet are Supreme or Vapor feet (or neither). Other than the asymmetrical design of the "shoulders" (or whatever) and tongue, and the size of the outer wrap (Vapor wraps around your foot more than Supreme), the rest of the differences are just minor composite material and configuration of the boot changes. Once the 2X skates come out, I'll be looking at upgrading to either 2S, 2X or maybe True/VH. I got into custom 1S when they came out, but I don't know if my feet are really Vapor or Supreme fit because there was no Vapor to get into at the time. Thanks, I'm still in my 11k ? love them and all but I've upgraded my equipment so much that skates are due soon. I've heard that the Vapors would be more for me due to my wide feet and bunion on my right toe. I will have to wait and see.